On September 1, 1939, the Perth Regiment received orders to mobilize. The Perth’s trained for two years in Canada before spending two years in England training and providing costal defence. 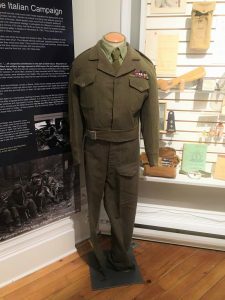 In January 1943, the regiment joined with the Irish Regiment of Canada and the Cape Breton Highlanders of Canada to form the 11th Infantry Brigade. The Regiment was deployed to Italy under the code name Exercise Timberwolf. The regiment first saw action on January 17th, 1944 at Arielli. This battle was the only time during the war that the Perths did not reach their objectives. As the allied invasion pushed through Italy and France, the Perths continued to play a key combat role. The Perth Regiment was the first regiment of the English Army to crack the Gothic Line. After their final action in the Italian Campaign with Operation Syria, the Perths were withdrawn in order to move through France, Belgium and into the Netherlands. By March, the Perths were in Nijimegn. During WWII, 261 Perths lost their lives. The regiment was awarded 10 primary battle honours and 4 secondary battle honours. Le 1er septembre 1939, le Régiment Perth avait reçu l’ordre de se mobiliser. Les Perths se sont entraînés pendant deux ans au Canada avant de passer deux ans en Angleterre pour l’entraînement et pour fournir la défense costale. En janvier 1943, le régiment avait joint avec le Régiment irlandais du Canada et les Highlanders du Cap-Breton du Canada pour former la 11e Brigade d’infanterie. Le Régiment était déployé en Italie sous le nom de code “Exercise Timberwolf”. Ils ont vu l’action militaire pour la première fois le 17 janvier 1944 à Arielli. Cette bataille était la seule fois pendant la guerre que les Perths n’ont pas obtenu leur objectif. Comme l’invasion alliée avait poussé à travers l’Italie et la France, les Perths avaient continué de jouer un rôle clé dans le combat. Le Régiment Perth était le premier régiment dans l’armée anglaise de fissurer la ligne gothique. Après leur dernière action dans leur campagne italienne avec “l’opération Syrie”, les Perths ont été retirés afin d’avancer à travers la France, la Belgique et les Pays-Bas. En mars 1945, les Perths sont arrivés en Nijimegn. Pendant la Deuxième Guerre mondiale, 261 soldats Perths ont perdu leurs vies. Le régiment a été décerné avec dix honneurs de bataille primaire et quatre honneurs de bataille secondaire. Lt. Col. M.W. Andrew D.S.O. began his military career in 1931 when he enlisted in the Militia as a subaltern (junior officer). In 1935 he qualified as a Lieutenant and attended courses in machine gun work at the Canadian Small Arms School in Ottawa. In March 1939 he was promoted to the rank of Captain and attained Majority in the same year. He left with the Perth Regiment as a Company Commander in 1941. While in Italy, Andrew became second in command. In 1944 during the fighting on the gothic line Lieut-Col Reid was injured and Andrew took command of the regiment as Lieutenant Colonel. During his time in command, the Perth Regiment was successful in every activity in which they participated. In recognition of his service, Andrew was awarded the Distinguished Service Order which recognizes distinguished service by officers. The award was presented while Andrew and the Regiment were stationed in Sneek, Netherlands. In 1946, Col Andrew, because of his legal background, was chosen to defend Major-Gen. Kurt Meyer, a Nazi Officer charged with being responsible for murdering Canadian prisoners. Meyer was convicted and condemned to death. Just before the ship carrying the Perth Regiment was about to leave the port, Col. Andrew returned from the Meyer war trial. Lt. Col. M.W. Andrew D.S.O. led the Regiment home. Following the reception and parade of the men, it was Andrew who dismissed the Regiment from active service in front of city hall on January 16th, 1946.